New Kids On The Block, the multiplatinum selling pop super-group, unveiled an epic lineup for their highly anticipated 2019 tour. NKOTB took to the Today Show plaza to reveal The MixTape Tour with very special guests Salt-N-Pepa, Tiffany, Debbie Gibson and Naughty by Nature. The five iconic pop and hip-hop acts will hit the road together for the first time ever on a 53-city tour across North America next summer. Tickets will are ON SALE NOW at Ticketmaster.com, ATTCenter.com, and 800-745-3000. The MixTape Tour will stop at the AT&T Center in San Antonio on Thursday, May 16. To celebrate the event, NKOTB surprised fans by dropping an epic, throwback track, “80s Baby” featuring their new touring partners, Salt-N-Pepa, Naughty By Nature, Debbie Gibson and Tiffany. The track takes listeners on a nostalgic yet refreshingly modern and fun ride through 80s song references and fresh verses - just a small glimpse into the party that will be The MixTape Tour. 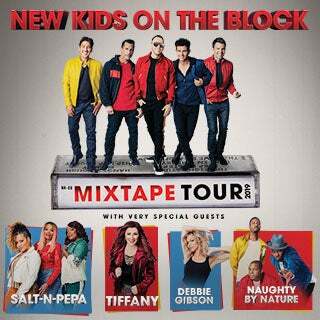 With over 100 million combined records sold worldwide, NKOTB, Salt-N-Pepa, Naughty by Nature, Tiffany and Debbie Gibson will fill arenas with hit after hit when they take to the stage next summer. Always upping the ante, NKOTB have packaged the ultimate lineup for a once in a lifetime live show experience. The group will return to the stage after 2018’s touring hiatus to perform fan favorite number one hits like “Hangin’ Tough,” “I’ll Be Loving You (Forever),” and “Step By Step”. When tour mates Salt-N-Pepa, Debbie Gibson, Tiffany and Naughty by Nature hit the stage, they bring with them top chart hits and legendary catalogues to keep fans out of their seats all night. The tour is sure to be one of the can’t miss events of the summer featuring an unforgettable night full of smashes spanning across generations.